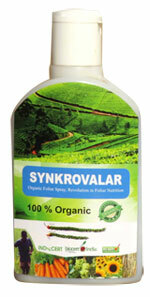 SYNKROVALARTM a premium quality product, contains purely natural amino acids of organic nitrogen. It contributes in improving the physiological status of crops suffering from a variety of stress conditions. The beneficial effect of amino acids and peptides on plants suffering from physiological or environmental stress (drought, extreme temperatures, sunburn, transplanting stress, etc.) is well researched. Besides their role as components of proteins and in plant metabolism, amino acids and peptides fulfill many other beneficial and useful roles : Improved plant health, pollen germination, fruit set, bioavailability of micronutrients, improved pesticide efficacy due to extraordinary adhesiveness, improved wetting and buffering of the spray mixture. Plant organs like leaves are able to take up free amino acids effectively. Application of amino acids as a Foliar Spray provides readymade building blocks for protein synthesis without going through the cycle of amino acids synthesis within the plant. Foliar application of amino acids is specifically useful and is proved, increases yield and quality of the plant significantly. This effect is further highlighted when amino acids are sprayed at important plant growth stages or at stages when higher nutrient demand exists in the plant.